Expiry - 3 years after manufacturing date. Need no washing after application! This cream is gentle to hair and skin. Silver does not cause skin allergy. 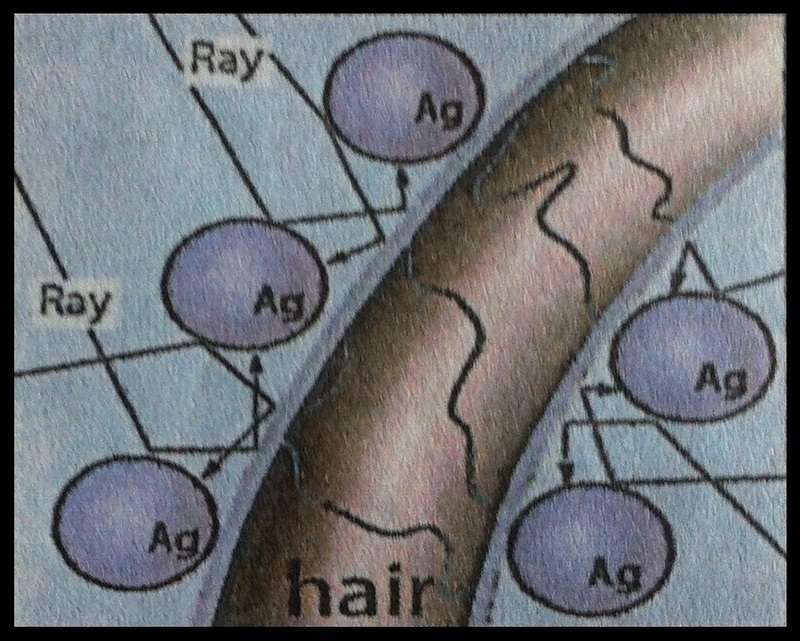 The mechanism which turn grey/white hair dark brown. When the silver ion 'dissolved in water' is exposed to light, it will change to Metal Silver particulates. 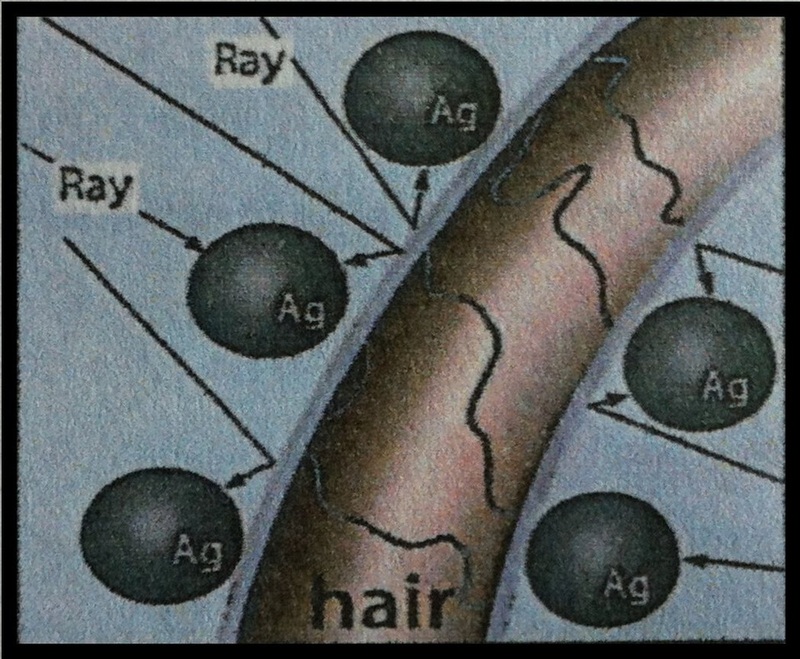 By absorbing part ofhte light, the Silver granule which is on the surface of the hair turns to dark-brown. This is a Patented Japanese approach to turns grey hair dark! Definitely different from others! That's why it is patented! 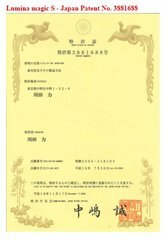 Alkaline chemicals, such as diamine system dye, Para Feni range amine, or toluene 2 and 5 diamine, and amonia and hydrogen peroxide (oxidizer) are not used in this product. - No need to combine with other liquid. 2. Easy to get dark brown color, and remains intact after repeated hair-wash, shampoo. 3. No acrid smell. No harm to hair or skin. 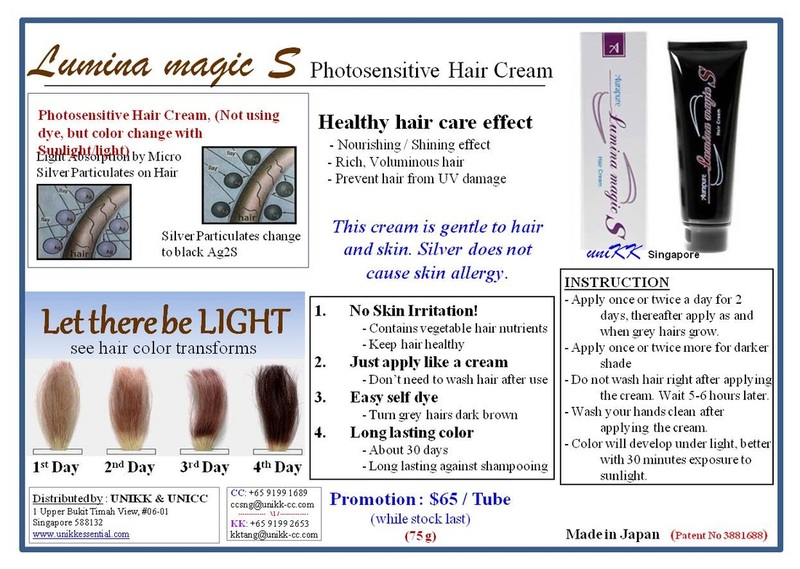 Here's the Video breakdown to ease understanding about Lumina magic S - patented Photosensitive Hair Cream; manufactured and packaged in Japan - Quality you can Trust. How does Lumina magic S Photosensitive Hair Cream works! The FULL Video Presentation. - Apply once or twice a day for 2 days, thereafter apply as and when grey hairs grow. - Apply once or twice more if the color does not show up evenly. - Do not wash hair right after applying the cream. Wait 5-6 hours later. - Wash your hands clean after applying the cream. - Color will develop better with 30 minutes exposure to direct light after application. • Immediately wash off if it gets in to eye. - Contact your doctor if you continue to get irritation. • Bleach the hair if you are going to have your hair dyed after using Lumina magic S.
Q How is the photosensitive hair cream effective to make grey hair dark color? A After you shampoo your hair, apply Lumina magic S to entire head. Thereafter, exposure to sunlight immediately is most effective. 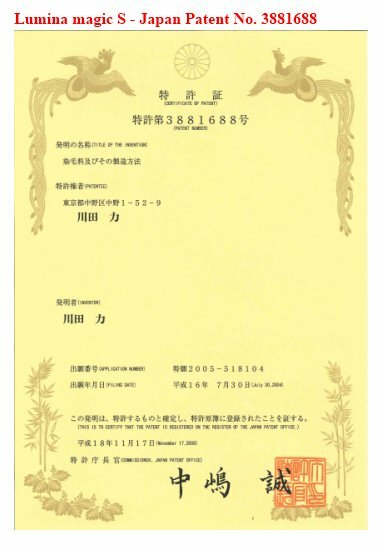 Q How much do I have to apply each time? A It depends on the length and amount of hair. Typically for man with short hair, 8-10 g is sufficient each time. Q Will the color of the hair turns black after using Lumina magic S? A It does not change to balck color. It will change to brown slightly after the first application. Q Do you have to mix with other hair dye? A No. The Lumina magic S is developed to work on its own. Do not mix with other hair dye. Q Can you use during pregnancy? Q Can it be used for those with metal allergy? A Because silver is said to be generated from silver sulfate, it is unlikely to cause metal allergy. Q Can you use when there is injuries to the scalp? A Please refrain from using the product where there are open wounds. Q Can coloring take place in door with artificial lightings? A If the brightness comes from 100W lightings, and the hair is close to the source, it will color in 10-15 minutes. Q Does it hurt your scalp and/or hair? A Unlike the usual dyeing, Lumina magic S does not use an alkaline agent nor an oxidizing agent, it does not damage the hair. 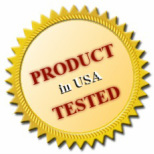 Furthermore, the photosensitive hair cream does not get into the inside of the hair. The cream stays attach to the surface hair. There is no problem to the scalp. Q If the hairline is not exposed to light, does the coloring on the hair be effective? A Coloring effect is proportional to the amount of light received. Q What light does it react with, eg. Infrared, ultraviolet, heat, light? A It reacts with ultraviolet (UV) and visible light. (Energy) affect the strength of the light rather than the wavelength. The more energy, the faster the coloring. Q Can I continue to use as a hair cream even after dyed? A There is no problem, because the color will become darker if you continue. When you have achieved the color you like, then discontinue with Lumina magic S. Use your normal hair cream instead. Q The color on my hair is uneven, how do I fix this? A Please apply to the part where you need a little extra color. Q What is the best way to apply the hair cream? A You can apply using a comb. For small areas (for touch up, for example), you may use the finger to apply to that area. Q If it gets into your eyes or mouth, what do you do? A In case of contact with eyes, rinse immediately with plenty of water. Consult your doctor for any medical treatment necessary. If it gets into the mouth, rinse your mouth, spit out the water. If swallowed, consult your doctor for any medical advice. Q After opening, how long can I use it for? A After opening, about 3 months is a standard. Don't believe the lies that we have to look grey as we mature! ..at least, not if you don't want to. HOW? The Word says - Be Transformed by the Renewal of Your Mind .ie,.. Change the way You Think! Lumina magic S is patented to give you the freedom to choose - to stay grey or look great with dark brown hair. 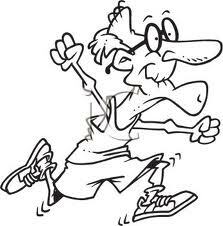 Oops ... nowadays, the young are also growing grey hairs from Stress, food we eat, air we breathe ... there is no end. This man says : I am going to have a ball! and you can't stop me! Life can be more fun if you look at it POSITIVELY! .. to determine by epidermal contact the primary irritation potential of a test specimen (Lumina magic S). .. to determine by epidermal contact the primary irritation potential of a test specimen (Silver Sulfate 0.8% Solution). .. to evaluate if the test articles would induce a mutagenic response in four different strains of Salmonella typhimurium, namely TA 98, TA 100, TA 1535, TA 1537 and E. coli WP2 uvrA. .. to determine the oral toxicity of the test article in rats at a dosage of (2) grams per kilogram of body weight.